All of you who just said “It’s a Studebaker,” go to the back of the class and write out 1,000 times: 1969 Avanti II (sans the Studebaker moniker). The confusion comes from the fact that, yes, Studebaker did build the Avanti from 1963-64 before the South Bend automaker threw in the towel, during which time only 4,643 of these sleek, fiberglass-bodied cars left the factory. In two more years the whole of Studebaker closed up shop for good. But… the Avanti lived on. 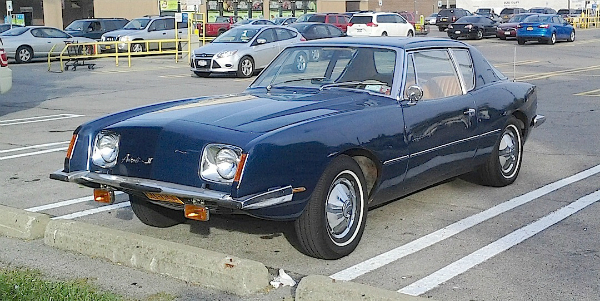 Indiana Studebaker dealer Nate Altman bought the rights to the name, along with the tooling and factory space, and began producing the Avanti II for model year 1965. In an on again/off again time line, the Avanti II (eventually just Avanti again) was produced through the year 2007 through a series of owners, factories, and design changes. This dark blue ’65 was seen a couple of weekends ago in South Buffalo. Jim Corbran, RRofWNY …and check out our Facebook page: Un-American Classic Cars The post RealRides Of WNY appeared first on Buffalo Cars.